bisi bele bath masala powder is a homemade spice blend to make bisi bele bath. 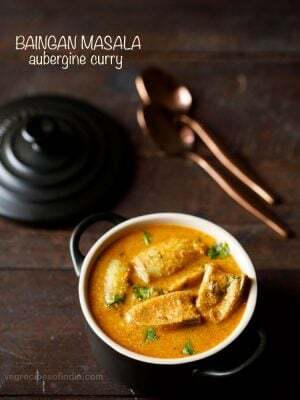 bisi bele bath powder recipe with step by step photos – a spice blend that is added to a very popular dish in karnataka – bisi bele bath, which is a spicy one pot rice, lentil and vegetable dish. i remember having bisi bele bath for the first time in bangalore in one of the mtr restaurants on the recommendation of hubby. 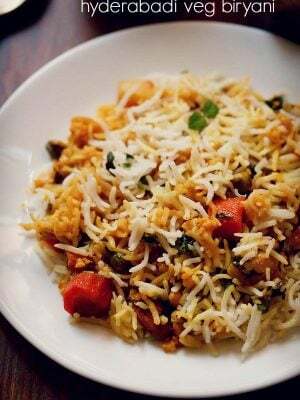 its one of his favorite rice-lentil dish which he would often have during his engineering stint in bangalore. the recipe of bisi bele bath was requested by one of my readers. i could have easily purchased a ready made bisi bele bath masala packet and made the bisi bele bath. but i thought why not give a homemade and authentic touch by making the spice blend at home. 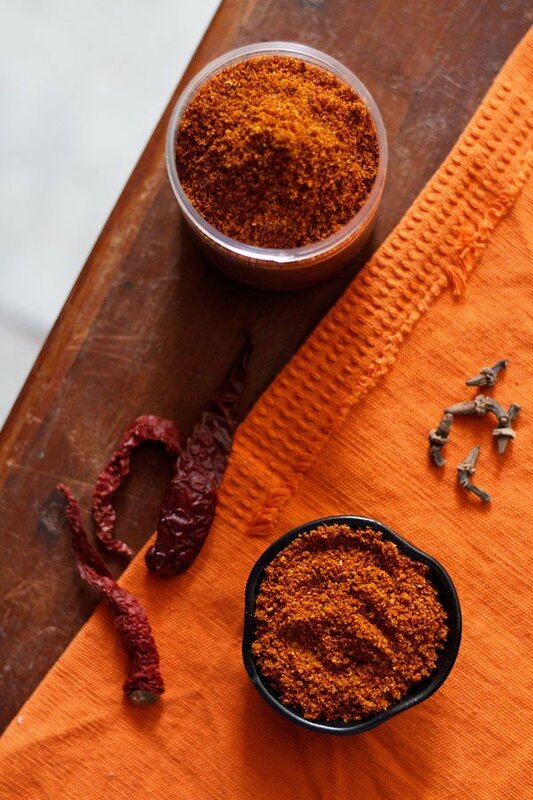 normally, i make all spice blends at home like cumin powder, goda masala, coriander powder, sambar powder, rasam powder and punjabi garam masala powder. these are much better than the store bought ones. 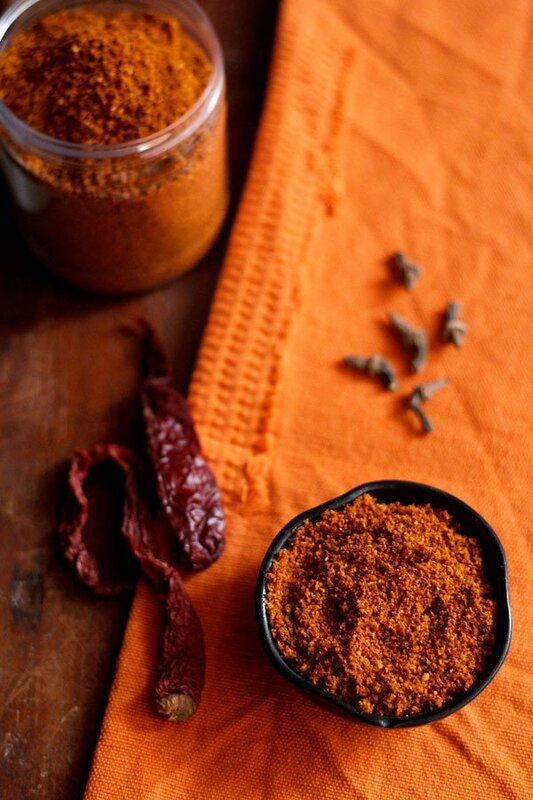 although it takes effort to make authentic masala powders at home but its worth taking this time and effort. to make this bisi bele bath powder authentic, a particular spice called as ‘marathi moggu‘ is added (the spice in center in the below pic). they are larger than cloves. they are buds of the kapok tree and hence also called as kapok buds in english. they have a musky aroma. this one special spice gives the bisi bele bath powder its important flavor. i would easily get marathi moggu in bangalore but not here. so i ordered them online. if you live outside india, you can order from amazon. below an illustrative pic of the spices used for bisibelebath powder. poppy seeds is missing from the pic. 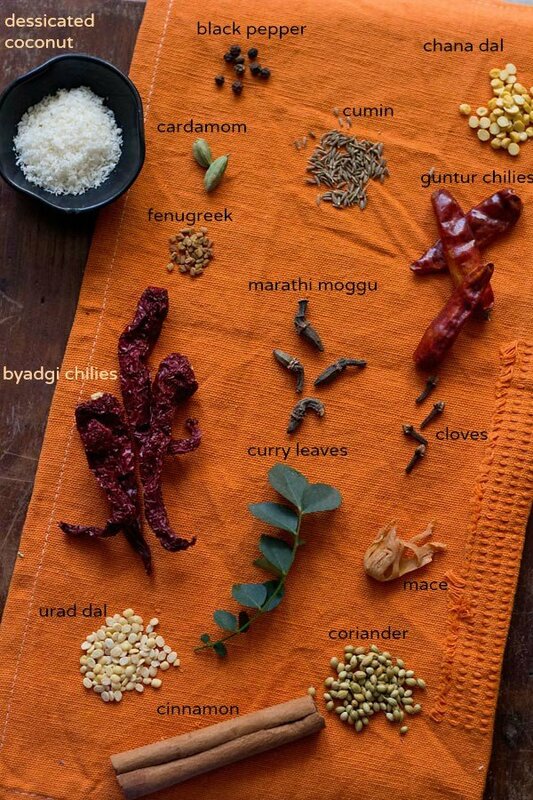 the amount of spices shown in this picture is illustrative and not the actual measures. 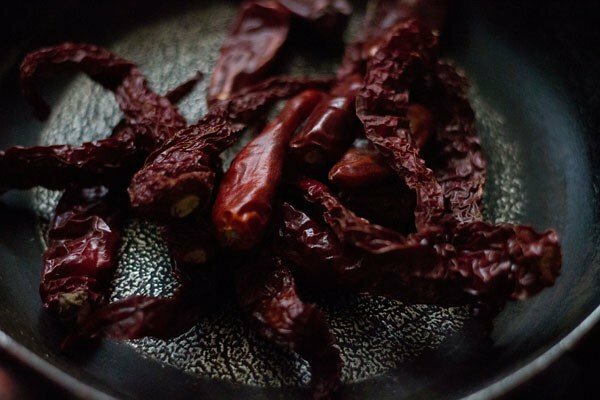 two kinds of dry red chilies are used. the byadagi variety of chilies give a deep red color and is less hot. the other type is guntur chilies which is a hot variety. 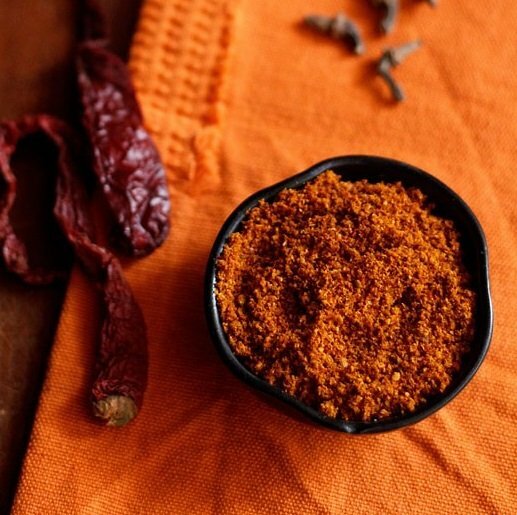 this bisi bele bath powder is slightly spicy and hot. 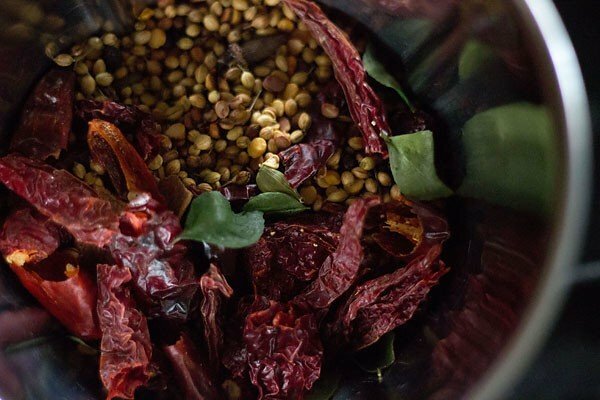 reduce the guntur red chilies in the recipe if you cannot tolerate spicy food. this recipe does not use asafoetida powder/hing. 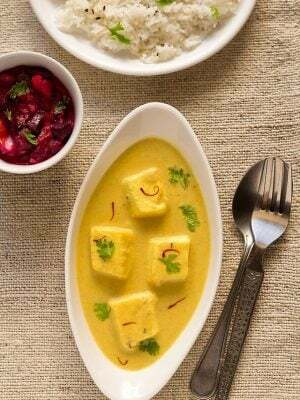 i usually add asafoetida to the main dish. but you can add asafoetida while making the masala powder. 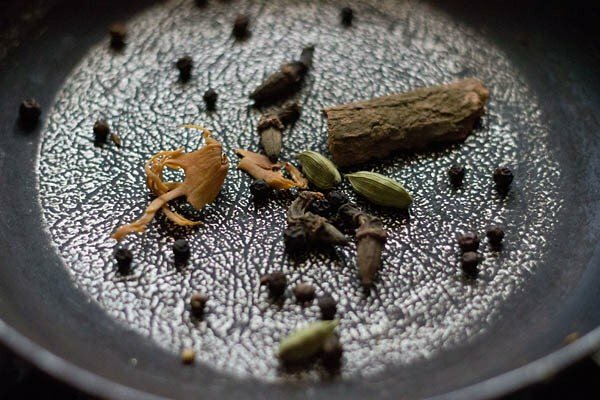 this bisibelebath powder recipe has been adapted from pratibha’s blog (her blog has some authentic recipes from the karnataka cuisine) and a cook book. i reduced the proportions and did make a few changes though. 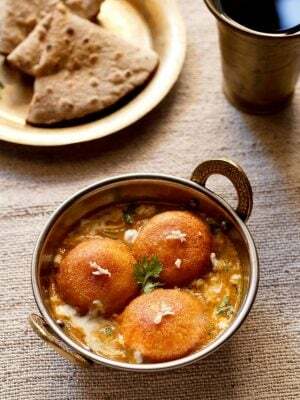 the recipe is good and gives you a really nice bisi bele bath. 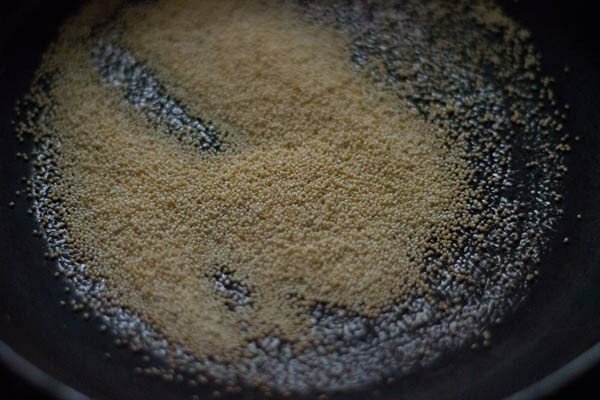 this recipe yields about 150 gms of the bisibelebath powder and stays good for a month in the refrigerator. 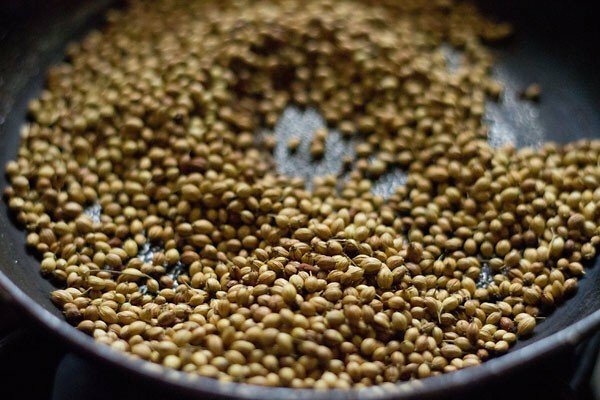 heat a frying pan or a small kadai and first dry roast the coriander, cumin and fenugreek until they are crisp and fragrant. roast on a slow flame and make sure you don't burn the spices. remove and keep aside in a plate or tray. in the same pan, now dry roast the cinnamon, cloves, black pepper, cardamom, mace and marathi moggu till become aromatic. remove and keep aside in the same plate and tray. now add chana dal and urad dal. these take a longer to roast than the spices. roast them till you get a nice lentil aroma and the lentils have become browned. keep aside. now dry roast the dry red chilies till they become crisp. 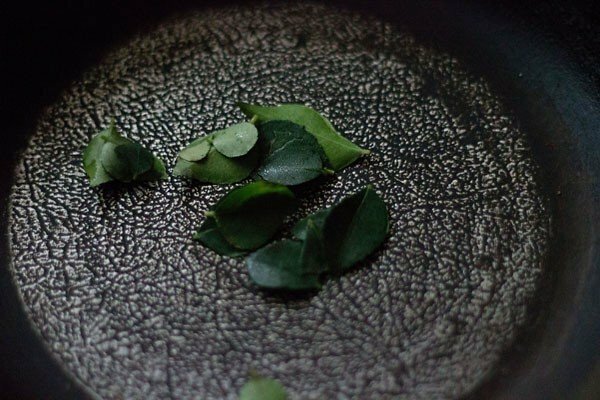 dry roast the curry leaves till they crisp. now roast the poppy seeds till they become light golden. dry roast the asafoetida if you plan to add it in the masala powder. lastly roast the dessicated coconut till the flakes become golden. now let the roasted spices cool. mix all the spices very well. break the red chilies in small pieces. deseed them if you prefer. add the ingredients in batches in a dry grinder or coffee grinder. grind to a fine powder. remove from the jar and store the bisi bele bath powder in an air-tight jar or container. keep the bisi bele bath powder jar in the refrigerator. use the bisi bele bath masala powder as required. 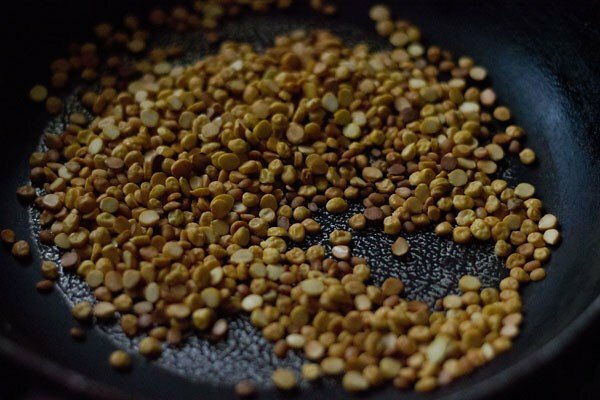 1. heat a frying pan or a small kadai and first dry roast the coriander, cumin and fenugreek until they are crisp and fragrant. roast on a slow flame and make sure you don’t burn the spices. remove and keep aside in a plate or tray. 2. in the same pan, now dry roast the cinnamon, cloves, black pepper, cardamom, mace and marathi moggu till these spices become aromatic. remove and keep aside in the same plate and tray. 3. now add chana dal and urad dal. these take a longer to roast than the spices. 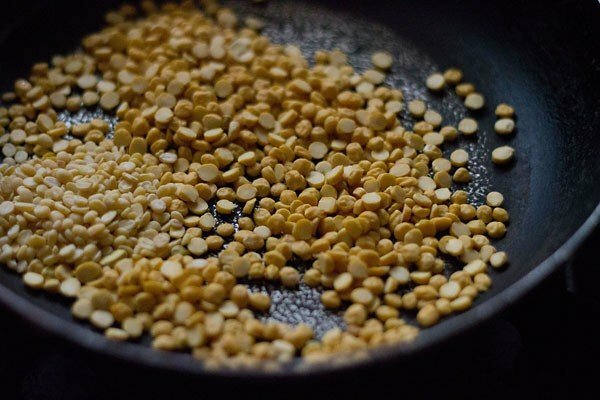 you can also roast the urad dal and chana dal separately. 4. roast them till you get a nice aroma and the lentils have become browned. keep aside. 5. now dry roast the dry red chilies till they become crisp. 6. dry roast the curry leaves till they crisp. 7. now roast the poppy seeds till they become light golden. 8. lastly roast the desiccated coconut till the flakes become golden. 9. now let the roasted spices cool. mix all the spices very well. break the red chilies in small pieces. deseed them if you prefer. add the ingredients in batches in a dry grinder or coffee grinder. 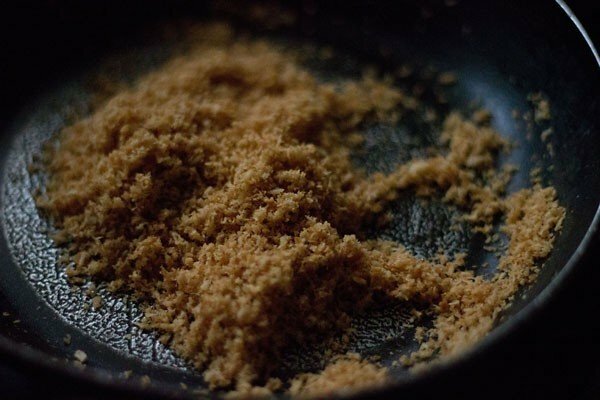 10. grind to a fine powder. remove from the jar and store the bisibelebath powder in an air-tight jar or container. 11. use the bisi bele bath masala powder as required. keep the bisi bele bath powder jar in the refrigerator. My mom also adds stone flower in this spice powder and says it is one of the key ingredients. thanks for the suggestion and letting me know. it will help the readers as well. I was looking for BBB, since it has been a long time I tasted any good curry using BBB masala. I shall give a try to make my own as I have my own Signature Blends in US. Thank you for sharing yours..
thanks and do let us know how the bisi bele bath masala powder goes for you. Welcome Diviraj. Nice to know this. Welcome Abi. Glad to know this. Can you give us the scaled down version for say one time use ? The same amount used in the bisi bele baath recipe. its difficult archana as i need to try and test the scaled down version. i always make a small jar of bisi bele bath masala and keep in the fridge. with spices, less or more can have not so good effects on the final dish. i know this from experience. Tried this yesterday and it was a big hit.. Thanks a lot. Tried few recipies from your blog always a hit for me. Especially the step by step photo makes lot more easier…. You are awesome and your way of cooking impresses everyone. You are a real pleasure to be known. 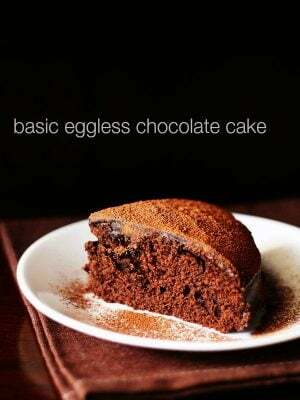 Thank you for sharing this recipe with everyone. I was impressed by the authenticity of your knowledge of ingredients and the care that you have taken to make this easy and attractive. The photography is also very good. Attention to detail is excellent. no idea. does not happen with me though. could be due to the kind of grinder. hey dassana, marathi moggu isn’t available at my place. can i skip this? would there be any difference in taste? ananya, you can skip it if you don’t have. there will be a slight difference in taste. but does not matter much. 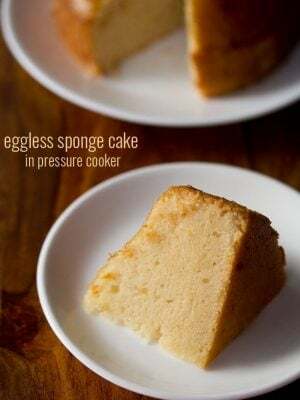 Whenever I am in quest of trying some thing new or want to clear my doubt regarding the recipes I know, you come to my rescue. Your recipies are very clear,simple and interesting to follow.photos are very clear and tempt me to try the dish at once.thank you. Is marathi moggu mean nagkeshar? sheetal, both are different. nagkeshar is known as cobra saffron. the pic is there in the goda masala post. welcome deepak. 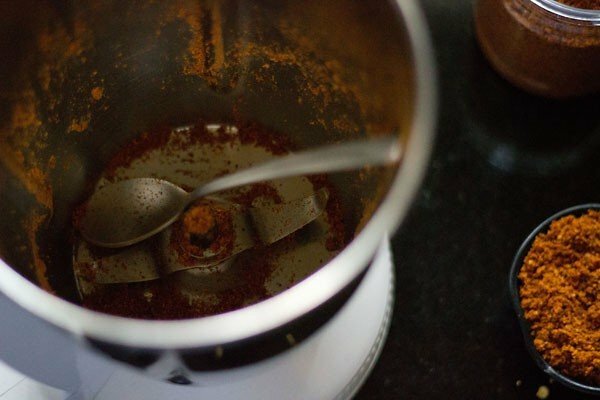 i have the hand written recipe of malavani masala shared by my mother. but didnt made the masala. i will share it soon. good you shared your feedback finally. its good to know what readers are liking in the blog. keep visiting the blog. 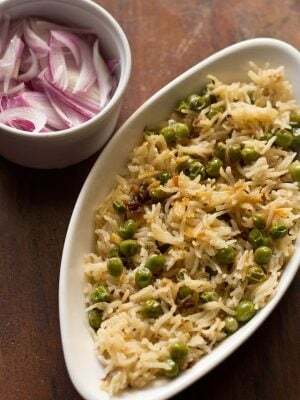 This recipe is the best Karnataka food item.. Though available in shops like MTR nothing like home made. My M.I.L used to fry them all and I would grind it in mixie. Thank you. Can you please also give recipe for “VANGI BHATH. another Karnataka tasty food and easy to prepare if you have the Vangl Bhath powder. thanks ramchander ji. i agree that bisi bele bath is one of the best recipe from karnataka cuisine. i will post vangi bhath recipe soon. Is the desiccated coconut also dry roasted or we should add some oil for roasting it? the desiccated coconut is also dry roasted. if you keep in the refrigerator it should stay good for more than a month. mine is still in the fridge and in good condition. its been more than half a month now. 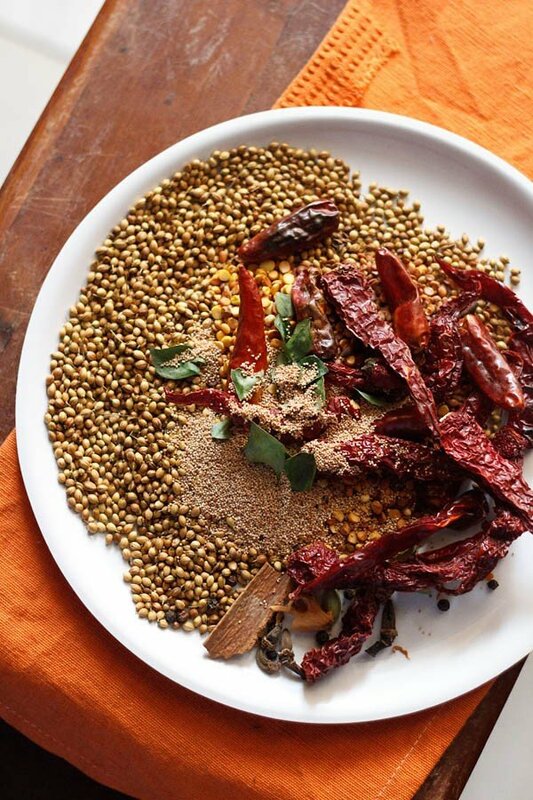 I too make spice mix at home ,some me and some from my mom .Loved ur version of bisibelabath masala powder.